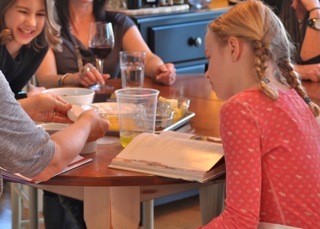 I recently spent a delightful afternoon cooking with some adorable cherubs. 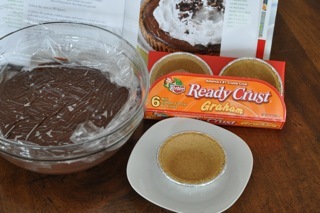 We tackled a scrumptious, made from scratch chocolate pudding cream tart. It turned out quite delightful, I’d have to say. 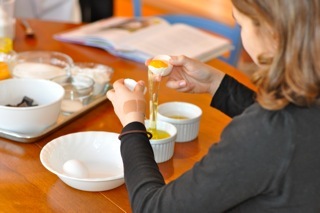 The best part was watching the cherubs’ first ever attempts at separating egg yolks. I love taking the freshest ingredients and cooking simple dishes made from scratch. 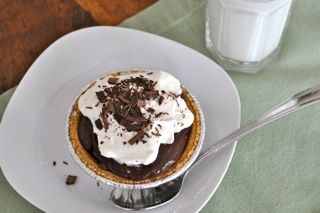 Compared to grabbing a box of Jell-O, this home made pudding is insanely good. Definitely worth the splurge. Cooking together creates such great food memories. 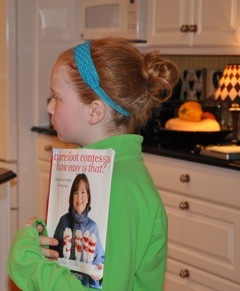 Memories associated with food are so provocative and I love creating them with kids. Did you know that one part of our brain stores memories as facts or data bites (like…. Pi=3.1416 or Columbus sailed the ocean blue in 1400 and 92). But like music, our taste and smell memories are stored in another part of our brain as a whole “story”. Once the memory is evoked, your brain brings back the whole story: sights, sounds, smells and emotions. I loved visiting my Grandma and Grandpa when I was little. Kid heaven. Their house always smelled like the fresh baked cinnamon bread my Grandma made every morning. I often sat in the kitchen eating homemade cinnamon bread still warm from the oven. My Grandpa and I liked to walk down to his garden. When the blueberry bushes were at the peak of season, we picked juicy, ripe berries still warm from the sun and gobbled them up for breakfast. After breakfast I would play jacks, hopscotch or scramble up to the top of my favorite apple tree in his orchard. I loved to sit in the branches and munch on the sour, not exactly ripe green apples. It seems like only yesterday… and all these memories were all evoked from one little whiff of cinnamon! I hope we are building good memories with the cherubs today. 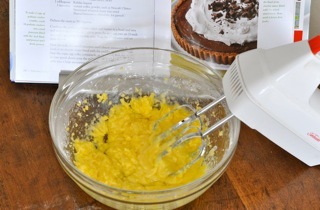 Our chocolate pudding cream tart recipe is from Ina’s latest book, How Easy is That? 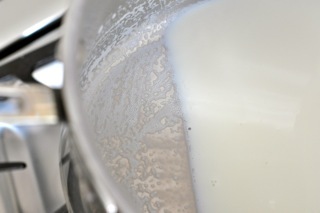 Heat the milk in a large saucepan until almost simmering. Turn off the heat. 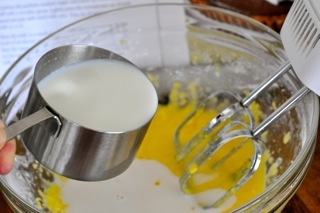 Place the sugar, cornstarch, egg yolks and salt in a bowl and whip until blended with a hand held beater. 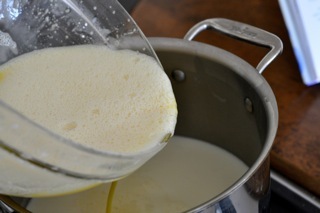 Add this mixture back to the pan with the hot milk. 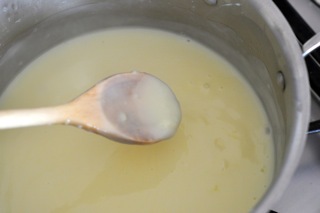 Turn the heat on medium low and cook for 5 to 10 minutes, stirring constantly with a wooden spoon until the mixture is very thick. It will coat the back of the spoon and look like this. Now for the flavor! 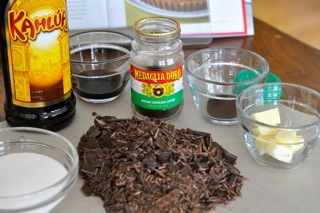 Take the pan off the heat and add the chocolate, butter, instant espresso granules and Kahlua. I bought a whole chunk of bittersweet chocolate at Whole foods and cut it up. You can also buy 4 oz. bars (get two) of Ghirardelli bittersweet chocolate at most grocery stores. I picked up the instant espresso coffee granules at the market too. 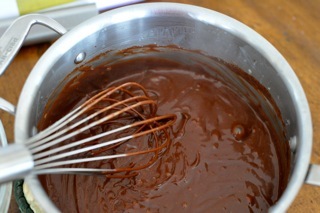 Whisk until shiny and smooth. 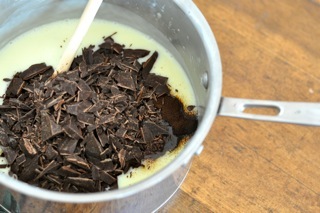 Transfer the pudding to a glass or plastic bowl and place plastic wrap directly on the surface of the pudding and chill until firm (about 4-6 hours). It will coat the back of the spoon.